Late last year, we were contacted by the P & C at Coolnwynpin State School as they had some ideas about how they wanted to update their tuck-shop area. The school also had a few sketches and ideas about the space as previously, they had run a design competition with the students to involve the students in the process. The P & C also wanted the sign to match the theme of the previous mural Sauce had created at the school. Sauce spent more time in pre-production with this mural as it included reworking the design process, involving a young person, and a cut-out detail for the sign. He also had to work around the school schedule which can be a challenge when you’re working with several different schools at once. 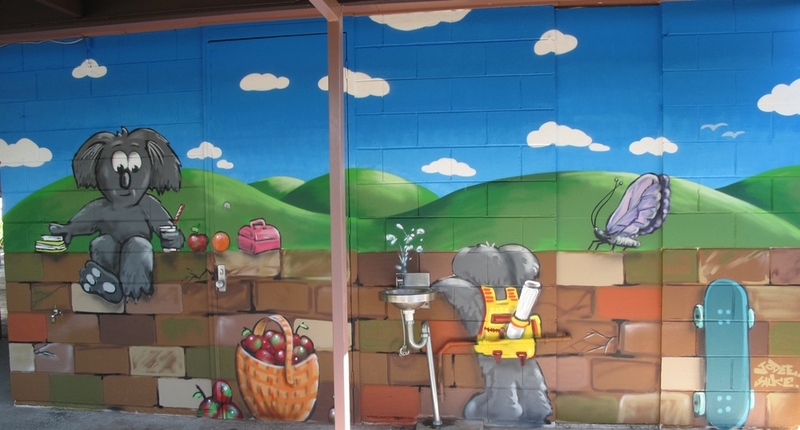 An honourable mention goes to the Groundskeeper, who fixed and primed the wall, making it ready for Sauce to paint on, and Jodee the School Captain, who help with the mural.